Before I go any further, I need to mention that Ted is a friend of mine. Plus I helped out quite a bit with Prototype Railroad Profile No. 1 because I had several photos of the L&N Pratt trussed single-sheathed cars that are the subject of this 39-page publication. So I am not objective, but rather enthusiastic to finally see this profile series. Military Modelers of airplanes, ships, and soft skin/armor subjects have had similar resources for years now. 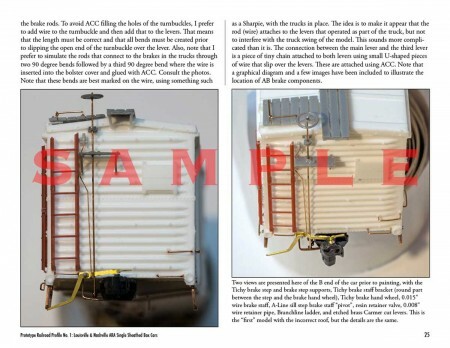 Finally freight car enthusiasts have a resource that goes into great detail on a single prototype subject. Reading through each, I see comments about various details and I just shake my head and say to myself, “Wow, how did he figure that out?” Or, “Where did he find that?” I am especially impressed by how much Ted knows about brake systems. For example, he is able to describe the layout each railroad preferred and where different devices, like slack adjusters, were used on the various groups of L&N and MILW boxcars. Ted knows his subjects. In Profile No. 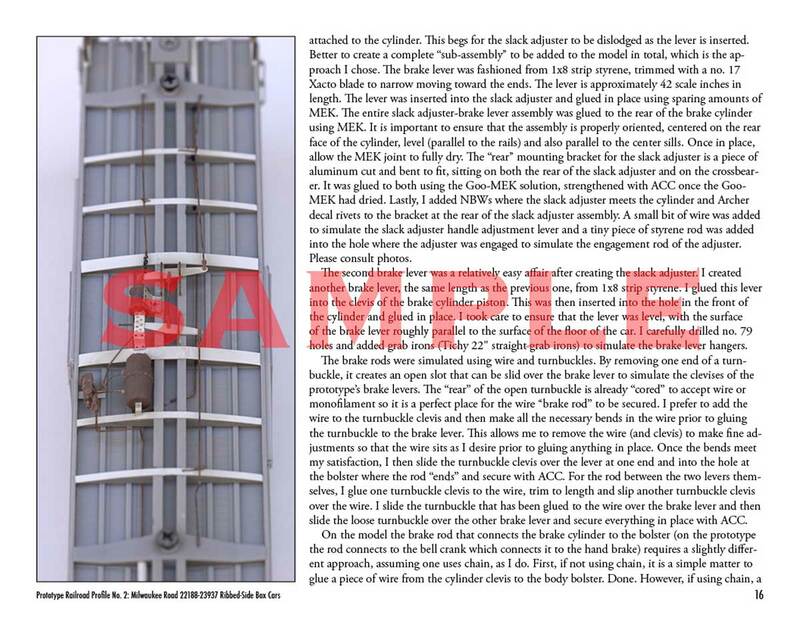 1, I was surprised to read about a roof system previously unknown to me. The L&N was a thrifty railroad and Ted points out how they used their ingenuity to save money when it came time to convert their ARA cars to AB brakes, something I plan to model now that I know about it. Ted Culotta’s model with roof hardware following the prototype. Eric Hansmann’s model built with no roof alteration. Okay time for a little Steam Era Railroad trivia. Among the railroads that built their own steam locomotives, the L&N’s South Louisville Shops were the fourth largest builder of steam locomotives. Which railroads comprised the three largest builders of their own locomotives? Post an answer in the comments below. In each of these debut volumes, there is at least one interesting modeling tip or technique. Tool tips are also included!. I wish I could describe examples but I don’t want to reveal too much. I was a Newspaper Photographer for thirteen years, so you won’t be surprised to know that I love photographs and I like to see as large as possible. A big positive with these Profiles is the landscape format that permits photographs to be routinely larger, making it easy to see important details. Two more profiles are in the works. Number 3 will examine the Northern Pacific’s’ 40-foot double-sheathed boxcars equipped with a fishbelly center sill and two truss rods, with a focus on building the Yarmouth Model Works kit. Profile number 4’s subject is the distinctive 45-foot panel side (I call them blister side) gondolas owned by the Missouri Pacific and its subsidiaries with a model build of the Funaro & Camerlengo kit. Okay this all well and good but you may be saying, “I am not a L&N modeler nor am I a MILW, NP or MP modeler so why should I care?” There is a saying among freight car modelers of the steam or steam-to-diesel era that I will paraphrase badly that goes something like, “No matter what you model you have to model Pennsylvania Railroad’s freight cars.” This is because the Pennsy owned so many freight cars. Frankly you could say the same about the New York Central, the Baltimore & Ohio, the . . . well any of the larger railroads really. Boxcars and 40- to 50-foot gondolas were loaded with a variety of commodities and hence interchanged freely, showing up just about anywhere and everywhere. Forty-foot boxcars carried virtually everything that needed to be kept dry and did not need to be refrigerated to virtually every point in the USA while nominal 40- to 48-foot gons were virtually the railroad’s pickup truck going everywhere. Model railroaders that want a representative fleet of boxcars and gondolas can easily justify NP, MP, L&N, MILW, etc. models. Of course depending on the date we model, which particular cars are appropriate often becomes the question. 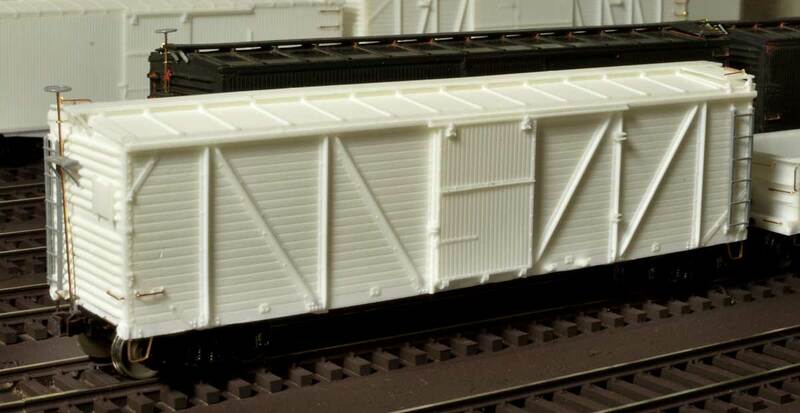 But no matter what our date, we will need plenty of boxcar and gondola models representing many different railroads, not just the cars of the railroad we model. But you know that. I do have a couple of nits to pick. I wish Ted would use a different typeface for his photo captions. It appears he uses the same type for text and captions, and this is confusing to my eyes. I would also like to see more white space around the text. Neither of these involves the content, which is excellent, but I do think they would improve the readability of the product. If you love freight cars and cannot get enough of them, you will enjoy owning Speedwitch Media’s new Prototype Railroad Profile series. The $7 cost is hard to beat for the amount of information in each electronic book and these arrive just in time for a Holiday stocking stuffer! There is one important caveat to mention about the sale process. Once payment is made, there is a limited time to download the document. This is to protect the seller. Thanks to Bill his comments on this new line of resources. Questions and comments can be posted below. Please follow the instructions so your comment can be posted. All comments are reviewed and approved before they appear. #1. Pennsylvania Railroad and #2. Norfolk and Western Railroad built many of their own Steam Locomotives. I’m not sure who might have been the third largest railroad building their own steam locomotives. Was the Illinois Central Railroad the third largest Railroad locomotive builder? I know it’s shops at Paducah, Kentucky were quite large!